In the secondary research process, various secondary sources such as Hoovers, Bloomberg BusinessWeek, and Space Magazines were referred to identify and collect information for this study. These secondary sources included annual reports, press releases & investor presentations of companies, white papers, certified publications, articles by recognized authors, gold standard & silver standard websites and commercial and military aircraft databases. After arriving at the overall market size using the market size estimation processes as explained above the market was split into several segments and subsegments. In order to complete the overall market engineering process and arrive at the exact statistics of each market segment and subsegment, the data triangulation and market breakdown procedures were employed, wherever applicable. The data was triangulated by studying various factors and trends from both, the demand and supply sides, in the EWIS industry. 1. Micromarkets are defined as further segments and subsegments of the EWIS market included in the report. 2. Core competencies of companies are captured in terms of their key developments, SWOT analysis, and key strategies adopted by them to sustain their position in the EWIS market. This research report categorizes the EWIS market based on application, end user, aviation type, component, and region. The electrical wiring interconnection system (EWIS) market is projected to grow from USD 5.4 billion in 2018 to USD 6.8 billion by 2023, at a CAGR 4.66% from 2018 to 2023. Factors such as the increasing demand for more electric aircraft and aircraft deliveries are the factors expected to drive the market. Growth in passenger traffic and upgrade existing aircraft fleet technology are expected to drive the growth of the EWIS market across the globe. The OEM segment is expected to lead the EWIS market during the forecast period. Based on end use, the EWIS market has been segmented into OEM and aftermarket. The OEM segment is expected to lead the EWIS market in 2018. 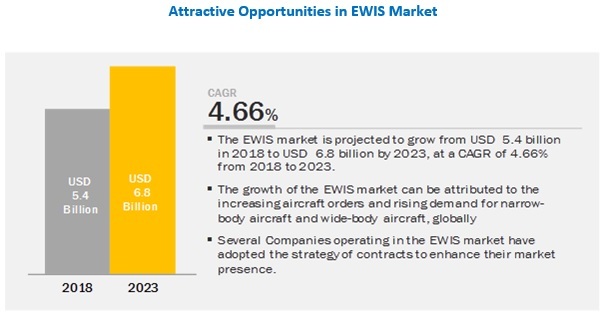 The increase in aircraft deliveries in emerging economies such as China and India is expected to drive the growth of the OEM segment of the EWIS market. The use of electrically-driven components in new aircraft is also leading to the growth of this segment as modern technologies used in aircraft require a lot of electrical connections. The interior segment of the EWIS market is projected to grow at the highest CAGR during the forecast period. Based on application, the EWIS market has been segmented into propulsion, airframe, interiors, avionics, and others. The interiors segment is projected to grow at the highest CAGR during the forecast period. The growth of this segment can be attributed to the need for enhancing passenger travel experience and upgradation of existing aircraft with new IFE systems. The EWIS market has been studied for North America, Europe, Asia Pacific, and Rest of the World (RoW). The North American region is expected to lead the EWIS market in 2018. The growth of the North America EWIS market can be attributed to the increased aircraft deliveries for both commercial as well as military applications. The major players in the EWIS market include Safran (France), GKN Aerospace (UK), Latécoère (France), TE Connectivity (Switzerland), Ducommun (US), and Amphenol Corporation (US), among others. The recent developments section of the report includes information on new products launched by various leading players of the market and contracts received by them between March 2014 and October 2018. In July 2018, GKN Fokker Elmo and Boeing (US) signed an agreement to extend the contract for the supply of EWIS to 737, 777 and P8A aircraft. In July 2018, Safran renewed its contract with Spirit AeroSystems (US) to provide electrical harness manufacturing and installation services. The contract extensions include more than 50 assemblies for the Boeing Next-Generation 737 and 737 MAX pylon wire harnesses, Boeing 787 guard wire assemblies, and wire harnesses for the 767 Tanker. In June 2018, Latécoère launched its new production plant in Belagavi, India. The new plant will initially focus on the assembly of wiring harnesses assembly for Dassault Aviation and Thales. What are your views on the growth perspective of the EWIS market? What are key dynamics and trends that governs the market, such as drivers and opportunities? What are the key sustainability strategies adopted by leading players operating in the EWIS market? What are the new emerging technologies and use cases disrupting the EWIS Market? Which are the key applications where EWIS play a significant role? What are the key trends and opportunities in the EWIS market across different regions and respective countries?